The choice if you are a caterer, or are wanting to prepare or serve meals to a number of guests. A professional-standard catering kitchen, it has a 6 burner Lincat gas hob and oven, a large extraction unit, professional dishwasher, and a full range of appliances to prepare and serve all food and drinks. Caterers should be aware that we do not provide knives, utensils and pans.There is a large two-jug coffee percolator, tea urn and microwave. We have a large refrigerator and freezer. There is a large serving hatch into the Assembly Room Theatre and access is via the rear stairs, ensuring that guests and kitchen staff can remain discrete throughout the event. The kitchen was fitted in 2013 and meets the high standards expected in a professional kitchen. 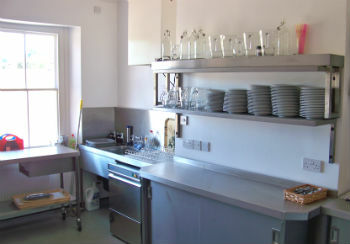 Ideal for community use, the ground-floor Prep Kitchen has everything you need to serve drinks, cakes and cold food. With a good amount of preparation space and all the crockery you could need, it is ideal for a cafe, buffet or cake sale. There is a fridge, microwave, kettle and coffee machine. We can offer special rates to charities and community organisations. Please contact us for further details. Our bar facilities are small but perfectly equipped for the sale of real ales and keg beer. There is a full gas and refrigeration set -up for lagers and hand-pumped real ales, wine chiller and all the necessary glassware and bar equipment. There is a large serving hatch to the Assembly Room Theatre ensuring that performances remain undisturbed. Our Theatre Bar service is provided at a rate of £50 per hour, including two bar staff.